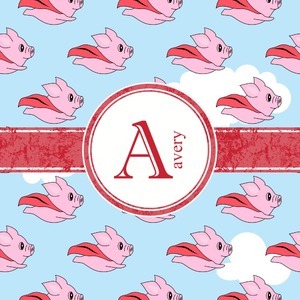 This design with pigs flying is simply fun and playful. The background is of course the sky. We then have a pink pig wearing a red hood flying like superman! We choose to add a vintage classic ribbon along with vintage round label. We also chose the initial and name style for personalization and we choose it all in red.